Catalogue of Organisms: Perciformes Go Bye-Bye? Not so long ago, I referred to the unholy taxonomic mess that besets the Acanthomorpha (spiny-finned fishes), the clade that includes (among others) the majority of familiar marine fish, with a large number of acanthomorphs previously dumped in a cluster called "Perciformes". "Perciformes", I'll remind you, was ichthyological code for "morphologically somewhat boring fish that aren't distinctive enough to be called anything else". Just yesterday, I received notification of a new paper (Li et al., 2009) that identifies a number of the same clades recovered in papers such as Dettai & Lecointre (2005) (which is not entirely surprising because both Dettai and Lecointre are also authors on this one). Where Li et al. (2009) differs from previous studies, however, is that it actually introduces a whole bunch of new names for the clades it finds. (Sadly, they also do something that is a bit of a pet peeve of mine, what I call "stealth taxonomy" - introducing new taxa in a paper without indicating that they're doing so in the title or mentioning their names in the abstract). The above diagrams from Li et al. (2009) represent a supertree for the Acanthomorpha taken from the results of Li et al. 's analyses. It's been broken into four parts because that's a lot of fish. You may need to click on the images to get a higher resolution picture to follow the next bit. The clade labelled P at the bottom of the tree doesn't get a name - some studies have found it as monophyletic, some haven't. What does get a name is the clade A uniting the Zeiformes (dories) and Gadiformes (cods) - Zeioigadiformes. That, my friends, is not a name to attempt whilst drunk. The Beryciformes (squirrelfishes and allies) are paraphyletic in the supertree (they're the first three clades leading towards the big P' clade), but some studies (including one of the analyses of Li et al. themselves) still find it to be monophyletic - another watch this space moment. The Ophidiiformes (cusk-eels, etc. - including the Carapidae that are famed for living inside the recta of sea cucumbers) are sister to the P' clade, which is what recent studies have come to call Percomorpha. Batrachoidiformes (toadfishes) are sister to the remaining percomorphs, but as you can see there's still a lot of messiness otherwise. Still, there are a few big clades that can be recognised, most notably the Q, L and X clades. 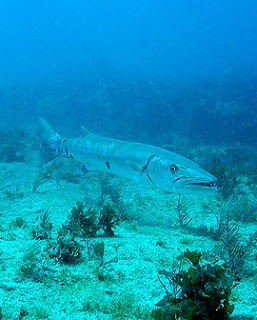 Sphyraena barracuda, now a member of the Carangimorpha. Photo from here. The Q clade includes the Atherinomorpha, Mugilidae (mullets), Blennioidei (blennies) and, in most studies, the Cichlidae (cichlids), though in the supertree the cichlids are apparently feeling a bit stand-offish. Li et al. dub this clade the Stiassnyiformes, for reasons sadly unexplained. The L clade, which Li et al. dub the Carangimorpha, includes the big pelagic fish such as dolphins, trevally, marlins, tuna and mackerel, as well as the flatfish. Within the L clade, things are still rather messy, but this is mainly the fault of the flatfish still trying to make themselves look polyphyletic despite all morphological reason. 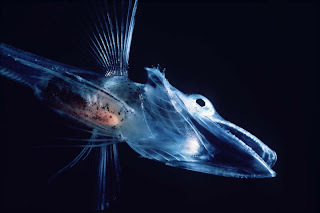 Unidentified icefish (Notothenioidei). Photo by Uwe Kils. The X clade is labelled by Li et al. the Serraniformes. I'm guessing that they decided, probably wisely, that "Perciformes" carries just a little to much baggage. Notable members of this clade include the Percidae, Notothenioidei (Antarctic icefishes), Gasterosteidae (sticklebacks) and what were the Scorpaeniformes (now known to be polyphyletic). 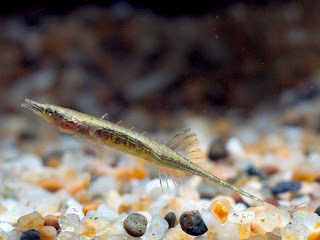 Indostomus paradoxus, the armoured stickleback or paradox fish of south-east Asia. Photo from hwchoy. A couple of smaller clades that rate a mention are the F and G clades. The F clade (now the Anabantiformes) includes the Anabantoidei (gouramis), Channidae (snakeheads), Indostomus (the paradox fish) and Synbranchiformes (swamp eels). The association of these taxa forms an intriguing clade of Old World tropical freshwater fish, with their diversity centred around southern Asia. 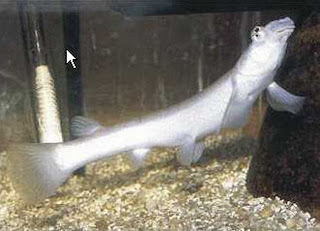 The G clade includes an assortment of "trachinoid" fishes such as stargazers and torrent fish, but not the Trachinidae themselves. Fittingly, Li et al. label this group the Paratrachinoidei. Part of the problem with dropping the idea of "Perciformes", to date, has been that to do so would leave a massive pile of unplaced families just flopping all over the place. Hopefully, with the pile of new clade names presented to us by Li et al., a big step has been taken towards allowing us to never have to say "Perciformes" again. Dettai, A., & G. Lecointre. 2005. Further support for the clades obtained by multiple molecular phylogenies in the acanthomorph bush. Comptes Rendus Biologies 328 (7): 674-689. Li, B. A. Dettaï, C. Cruaud, A. Couloux, M. Desoutter-Meniger & G. Lecointre. 2009. RNF213, a new nuclear marker for acanthomorph phylogeny. Molecular Phylogenetics and Evolution 50: 345-363. That, my friends, is not a name to attempt whilst drunk. Dolphins? Aren't they supposed to be sarcopterygians? Nah, that would be dolphins. I, on the other hand, was referring to dolphins. Stiassnyiformes is after ichthyologist Melanie Stiassny, from the AMNH.